A spokesman for the Senate Judiciary Committee who was involved in Brett Kavanaugh’s nomination to the Supreme Court has abruptly resigned after allegations surfaced that he was dismissed from a previous job following a claim of sexual misconduct. Garrett Ventry had been working as a communications official for the committee and focusing on messaging for the GOP amid Christine Blasey Ford’s allegation of sexual assault against Kavanaugh. “Garrett was one of several temporary staff brought on to assist in the committee’s consideration of the Supreme Court nomination, a team that has done outstanding work,” a Judiciary Committee spokesperson told The Hill on Saturday. “While he strongly denies allegations of wrongdoing, he decided to resign to avoid causing any distraction from the work of the committee,” they added. Ventry denied any “allegations of misconduct” in a statement to NBC News, which first reported his dismissal on Saturday. Ventry had previously worked for the conservative firm CRC Public Relations. A company spokesperson said in a statement to The Hill that Ventry had been on a leave of absence. “We were not aware of these allegations, which he denies. As of this morning we have accepted his resignation,” a company spokesman said. Politico had reported this week that CRC assisted lawyer and activist Ed Whelan in promoting an unfounded theory about the sexual assault allegation against Kavanaugh, which Whelan later removed from Twitter. NBC News reported Saturday that Republicans were concerned Ventry could no longer lead messaging surrounding the Kavanaugh allegation because of the allegation made in his past. The allegation was reportedly made by a female employee of the North Carolina GOP General Assembly. Ventry worked as a social media adviser in North Carolina House Majority Leader John Bell’s office last year. Bell fired Ventry after a few months. The North Carolina leader told NBC News that Ventry had worked in his office and “moved on,” but declined to discuss specifics surrounding the dismissal. Ventry’s departure comes as the GOP-led Senate Judiciary Committee negotiates with Ford’s lawyers over her appearing before the panel next week. Grassley has given Ford until 2:30 p.m. on Saturday to decided whether to testify about the allegations. This post was last updated at 11:41 a.m.
(CNN) A former top communications aide to Democratic Rep. John Conyers of Michigan offered a defense of his former boss amid Tuesday growing allegations of sexual harassment, saying it wasn’t uncommon for staffers to accidentally see the congressman in his underwear. 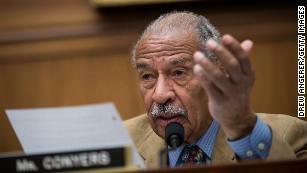 One former employee, Melanie Sloan, came forward with allegations last week, including one instance where Conyers called her to his office when he was in his underwear. Bob Weiner, who served as Conyers’ communications director from 1994 to 2000, spoke to reporters and photographers assembled outside the Congressman’s office, disputing Sloan’s allegations. “Something else that people need to know: his closet is in his office right here. He changes clothes in his office. Most of us have walked in on him accidentally without knocking and have seen him in his underwear. Big deal. That’s where his closet is, he changes his clothes there. So to say that somebody came to a meeting and that’s how it was, that’s an untrue statement. That is the kind of thing that needs to be explored before there’s any acceptance to that kind of an allegation,” Weiner said, later clarifying that all members of Congress have closets in their offices. The House Ethics Committee announced last week it has opened an investigation into allegations against Conyers after BuzzFeed reported that he settled a wrongful dismissal complaint in 2015 after allegedly sexually harassing a staffer. 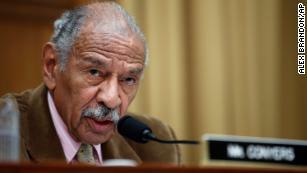 Conyers denied wrongdoing in that case, but acknowledged that there had been a financial settlement to that complaint. 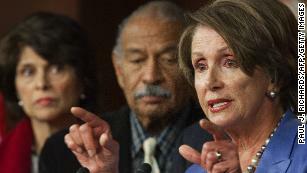 Another former staffer, Deanna Maher, told CNN that Conyers made three sexual advances toward her when she worked for him in his district office in Detroit from 1997 to 2005. Through his lawyer, Conyers also denied wrongdoing in that case. Weiner, who also helped set up Conyers’ leadership PAC, said the mood in the congressman’s office is “very depressed” and current staffers are hoping he can complete his term amid growing pressure to resign. CNN’s Sara Ganim, Sarah Jorgensen and Sophie Tatum contributed to this report. “It makes me a little upset to see him on television,” Kyle Godfrey-Ryan, a former assistant for Rose during the mid-2000s, said. “Everything I experienced with journalism there made me not want to stay.” She added that Rose fired her once he learned that she had confided to a mutual friend about his behavior. Fox News has ended its association with Bill O’Reilly, the combative TV host and commentator who has ruled cable-news ratings for nearly two decades and was the signature figure in the network’s rise as a powerful political player.The conservative-leaning host’s downfall was swift and steep, set in motion less than three weeks ago by revelations of a string of harassment complaints against him. The questions about his conduct represented yet another black eye to Fox, which had dealt with a sexual harassment scandal involving its co-founder and then-chairman Roger Ailes, just last summer.